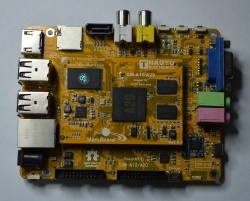 The MarsBoard A20-SOM was a short-lived, credit-card sized, extendable board with an Allwinner A20 SoC. The SOM variant (different from Marsboard A20) has a completely different design though, with a SOM and a baseboard. The 'ESC' button triggers FEL mode. This page was last modified on 8 December 2018, at 04:56.